Is chili your favorite fall comfort food? Do you have a secret chili recipe that always impresses your family and apartment guests? Then, this cook-off is for you! October is National Chili Month and to celebrate, New York's only all-chili restaurant, Lucky 777 Chili Parlor and your East Village craft beer spot Jimmy's No. 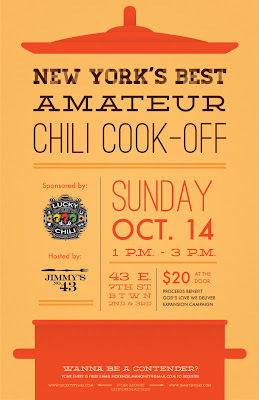 43 are hosting New York's Best Amateur Chili Cook-Off on Sunday, October 14. From 1-3 p.m., sample, compare and judge amateur chili chefs and their homemade versions of your favorite comfort food. Top prizes will be awarded to The People's Choice and The Judge's Choice. Tickets are just $20 for unlimited tastings, fresh baked cornbread muffins and a voucher for a Lucky Taco at Lucky 777 Chili, mentioned in my recent CBS New York article as one of the best cheap eats in the West Village, until December 1. All proceeds from this event will benefit God's Love We Deliver and their expansion program. 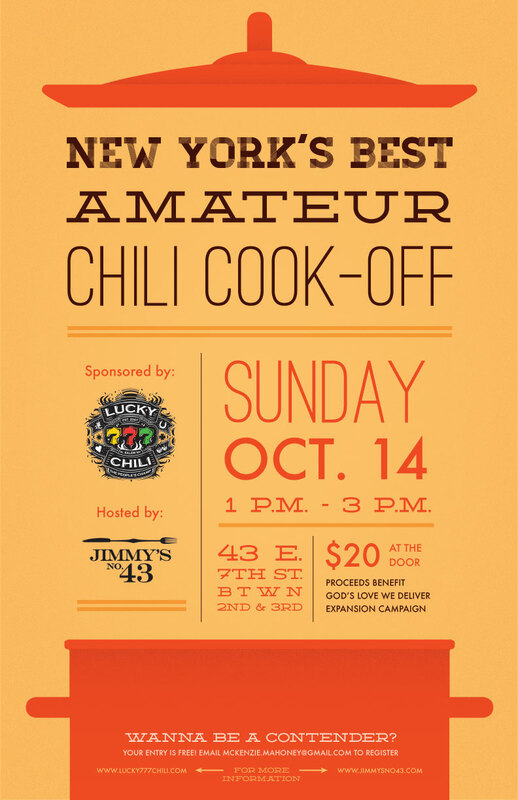 For more information or to register as a contestant for New York's Best Amateur Chili Cook-Off, contact blogger and Lucky 777 Chili rep McKenzie Mahoney at 202-679-5544 or mckenzie.mahoney@gmail.com. Celebrate The 2nd Anniversary of Idle Hands Bar!